CENTRAL BANKS weigh a host of factors—such as stability, liquidity and returns—when managing their foreign reserves. Most opt to hold dollars: according to the IMF, the dollar accounts for 62% of global foreign-exchange reserves. The Central Bank of Russia (CBR), though, must also consider geopolitics. On January 9th it revealed that it had dumped $101bn in dollar reserves last spring, shifting instead to euro and yuan holdings. The dollar had accounted for nearly half of its $430bn of reserves at the end of 2017 (see chart). Six months later only 22% of reserves were held in dollars, at least half of which were held outside America. Strikingly, yuan holdings jumped to nearly 15%, a share ten times the average for global central banks, and a reflection of China’s growing importance for Russia’s economy. The shift took place against a flurry of sanctions-related news. In April 2018 President Trump’s administration had slapped restrictions on Russian oligarchs, including Oleg Deripaska and Viktor Vekselberg, as well as their publicly-traded companies, such as Mr Deripaska’s aluminium firm, Rusal. The move roiled markets and sent the rouble tumbling. American lawmakers were threatening tougher measures, including bans on trading new sovereign debt that would limit Russia’s ability to tap bond markets. Although freezing central-bank assets would have marked a radical escalation—beyond even the toughest measures discussed in Washington—the CBR opted for what Oleg Kouzmin of Renaissance Capital, an investment bank, calls “ultra-cautious portfolio management”. American officials, fearing the impact of sanctions on industry, are considering lifting them on Mr Deripaska’s companies provided he gives up control. But this week Congress sought to block the step. 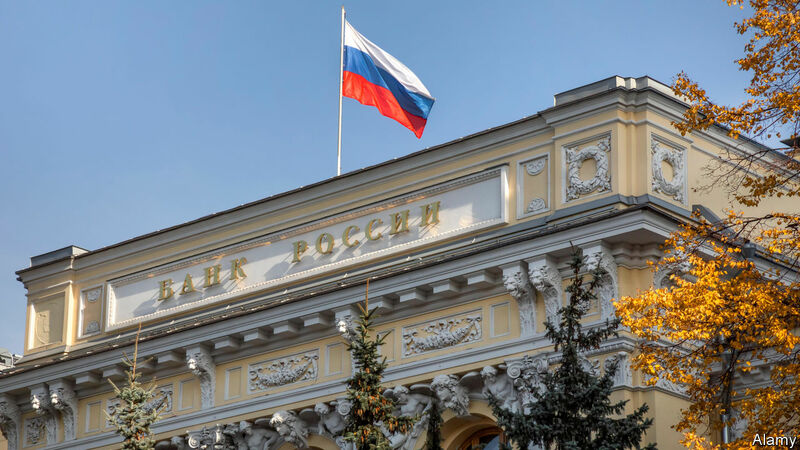 The central bank’s decision is the most dramatic manifestation of Russia’s broader desire to hedge against further sanctions. Vladimir Putin, Russia’s president, has endorsed a plan to “de-dollarise” the Russian economy. The government wants to encourage Russian companies to transact in other currencies. Andrei Kostin, the head of VTB, a state bank under American sanctions, has pushed for Russian firms to de-list from foreign stock exchanges and re-list at home. Some companies are testing dollar-free waters: in August Alrosa, a diamond giant, announced it would accept payment from Chinese and Indian customers in roubles. In November Russia’s finance ministry issued a €1bn euro-denominated bond, its first since 2013. Yet the plan to de-dollarise ultimately comes up against market and economic realities. Dmitry Dolgin of ING, a bank, reckons that the central bank will need at least $65bn in dollar reserves to cover the finance ministry’s foreign-exchange liabilities. Moreover, the Russian economy remains heavily dependent on commodities, which are typically traded in dollars: nearly 70% of its exports are processed in the currency. 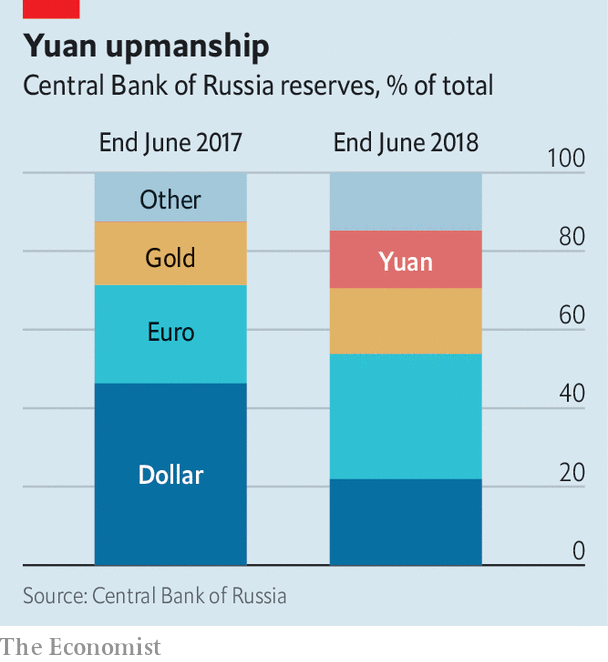 Although the share of rouble- and yuan-denominated transactions has been growing, the finance ministry reckons three-quarters of bilateral trade with China still rides the greenback. Ending the dollar’s dominance is not so easy.